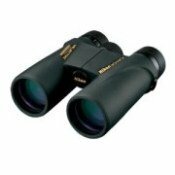 The Nikon Monarch 5 ATB 8x42 Binoculars (model 7576) are one of the best bird watching binoculars you can purchase. There's been a name change with these - they used to be called Monarch ATB Binoculars or the Monarch III, but are now simply the Monarch 5 line. To view and compare all models in the popular Monarch line, view our comparison tables on our Nikon Monarch Binoculars review page. We've done a lot of research before choosing our binoculars and decided upon the Nikon Monarch 5 ATB 8x42 Binoculars for several reasons. For the price and all the below features, we really couldn't find a better deal. We use them for leisure bird watching activities as well as in our professional work doing bird surveys. Eco-Glass lenses made without led or arsenic. 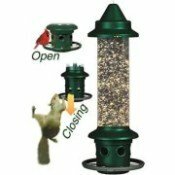 "...clearly the top-rated of any mid-priced, full-power birding binoculars. These lightweight, waterproof, and very comfortable binoculars focus down to 6 feet (they were given the name "Monarch" to attract butterfly watchers) and offer an image and feel that surpasses many models costing two or three times more. Only in a direct comparison with the top-priced binoculars could our reviewers discern the narrower, slightly duller image, which was not quite sharp at the edges. But with a street price well under $300, the Monarchs are a steal." We are very happy with the Monarch's. The image is fantastic, the bins are very comfortable to hold and we love that they are waterproof, fogproof, and shockproof. 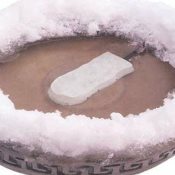 You can feel that they are constructed well and are rugged enough to take some outdoor abuse. We use them for work doing bird counts as well as for leisure birdwatching and haven't been let down yet. I really don't think you can beat the Nikon Monarch's for the price unless you consider something like these Zeiss 8x42 FL T Binoculars (over $1,000). We use our Monarch's for bird watching, but we know that hunters also love them for their crisp, clear images and lightweight, rugged construction as well. 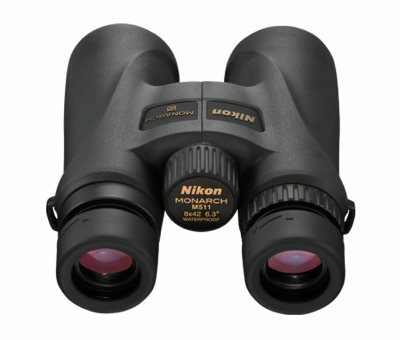 We hope you enjoy your new Nikon Monarch ATB 8x42 binoculars whether watching birds, butterflies, or any wildlife! Let us know what you think when you get them! Nikon Monarch Binoculars - A review of all Monarch Binoculars, including the Monarch 3, Monarch 5, Monarch 7 and Monarch X ATB Binoculars. 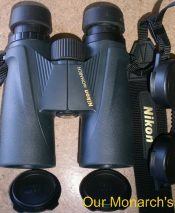 Nikon Action Binoculars - A review of the most popular Nikon Action Extreme Binoculars, a good choice for a "cheaper" low-cost pair of binoculars. Bushnell Legend Ultra HD Binoculars - Another good choice for a mid-price birding binoculars, especially if you prefer a 10x42 magnification model.